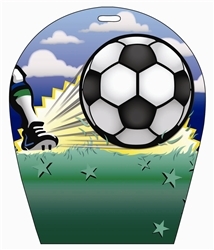 Lenticular Luggage Tag, arch-shaped, kicked soccer ball | Lantor Ltd.
DO you love soccer? Have you ever had trouble looking for your luggage at the airport? With our unique Arch Shaped Lenticular Luggage Tags the confusion of identifying your bag will no longer be an issue. Airport safety now requires all bags to have Luggage Tags with your contact information, so why not do it in style? Our Lenticular Sports Luggage Tag offers brilliant color changing images and various custom shapes that have room to advertise your message on.